Suits, sport jackets & tuxedos fit for any occasion. This line is a product of passion that is driven towards creating a perfectly fitted slim fit suit, crafted from only the best natural materials. Giovanni Bresciani suits, sport jackets & tuxedos give you the best of both worlds. Whether you are looking for a suit to wear to work every day, a fancy suit for a special event, or something stylish to wear to dinner or a play, the Giovanni Bresciani collection accommodates your look for any occasion. Giovanni Bresciani, co-owner of SRG, takes great pride in naming this line after himself. This line is a testament to his obsession to create the perfect fitted slim fit suit. 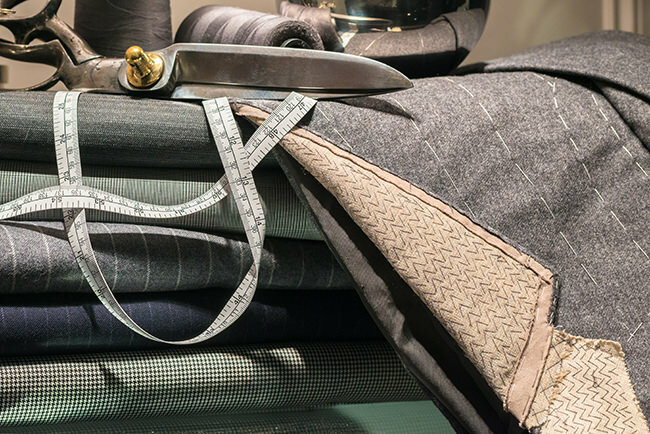 He personally goes through thousands of fabrics to select the absolute best fabrics for the suits that bear his name. Our designers carefully browse through thousands of the finest fabrics before selecting only the absolute best super-fine Merino wools, high-quality cashmeres and mulberry silks. Contrast buttonhole stitching, sharp and fancy linings, peak lapels, ticket pockets, soft shoulders, patch pockets, and contrast lapels are just some of the bells and whistles that can be found in the Giovanni Bresciani line. Giovanni Bresciani Slim Fit suits are designed to fit tailor made right off the rack. You don’t have to take in the sides, shorten the sleeves, or taper the pants to give you that desired fitted look. His pursuit of the perfect fit is evident once you put on a Giovanni Bresciani Slim Fit suit and it fits like it is tailor made, unaltered.